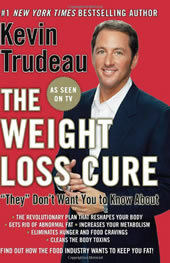 The Weight Loss Cure “They” Don’t Want You to Know About is written by Kevin Trudeau, an author that frequently appears on late night infomercials. It is based on the work of Dr. Simeons who is a British endocrinologist from the 1950’s. Trudeau claims that this information has been withheld from the general public because it is more profitable for the drug companies and medical establishment to keep people obese so as to increase revenue from surgery and pharmaceutical drugs. The Weight Loss Cure involves a combination of injections, supplements, cleansing regimes and organic foods that Trudeau claims will “melt away 30 pounds in 30 days without dieting, hunger, cravings, exercise, deprivation, or surgery”. The first phase requires dieters to adhere to an organic diet that is highly restricted in regard to which foods are allowed. During this phase dieters must follow a regimen of colonics and liver cleansing procedures that detoxify the body so as to prepare it for weight loss. The second phase is concentrated on weight loss and dieters undergo daily injections of a hormone called HCG – human chorionic gonadotropin, which is a hormone found in the urine of women when they are pregnant. In this phase dieters must adhere to a strict low calorie diet. In the third phase dieters no longer undergo the HCG injections, but must continue with an organic diet and various cleansing procedures. The fourth phase includes specific cleanses for the kidneys and liver as well as treatments to remove parasites and heavy metal residues from the body. Throughout the program dieters are advised to consume 8 glasses of pure water daily. A substantial breakfast should also be consumed daily and a large salad is to be eaten at lunch and dinner. Eating is not permitted after 6pm. There is a long list of foods to avoid however dieters a given a little leeway with the instruction to give in to one of their cravings each day. Grapefruits, apples, organic meat; poultry and fish, vegetable salads, hot peppers, apple cider vinegar, fresh juices, raw nuts and seeds, noni, mangosteen, aloe vera, acai berry, raw honey, bee pollen. Dieters are advised to walk for at least an hour continuously each day. Rebounding on a mini trampoline is also recommended for ten minutes each day because it stimulates the lymphatic system and boosts metabolism. Other forms of exercise such as yoga, Pilates, martial arts and calisthenics are recommended so as to increase muscles mass, which also increases metabolism. Also, these exercises could be used. The Weight Loss Cure retails at $24.95. There are many supplements that are essential for the Weight Loss Cure, in addition to the HCG injections, this will make the cost out of the range of the majority of dieters. Eating breakfast is associated with a reduced appetite later in the day. Not eating after 6pm is likely to reduce calorie intake and will reduce the risk of late night snacking on high calorie foods. Encourages the intake of organic fruits and vegetables. Speaks to those who have tried many other diets without achieving results. Offers many tips that support a healthy lifestyle. Allows for some freedom with one indulgence allowed daily if desired. Calories in phase two are very low and will not supply adequate levels of nutrients. HCG injections are not approved for weight loss in most countries and it may be difficult if not impossible to find a medical professional who is willing to perform the treatment. Scientific studies have shown that HCG injections do not produce weight loss. HCG may produce side effects especially for men. Colonics may cause electrolyte imbalance and are not appropriate for some dieters. Claims that the plan is easy to do and allows dieters to eat whatever they want are obviously false. Assumes a ‘one size fits all’ approach to weight loss. Many readers will not relate to the author’s emphasis on the activities of the FDA. Author has no nutrition or medical credentials. Requires many supplements, which will make the program very expensive. The myriad of supplements, the requirement for HCG injections and the advice to consume only organic food will place the Weight Loss Cure outside the capacity of most dieters. Dieters considering this plan must be very cautious to weigh up the potential risk factors of HCG injections and are advised to seek the counsel of a trusted health care professional. It is unfortunate that this diet is associated with Trudeau. The work was really done by Simeons, and fits in with other very low calorie diets used to successfully induce weight loss before WWII. At the end of the 500 calorie phase, the diet resembles the South Beach diet. It ups the calories to normal levels, to a diet high in protein, and green leafy veggies, and slowly adds back in sugary/starchy foods until you find a point where you neither loose or gain weight. I am currently on this diet and love it! The 500 calorie phase requires a lot of discipline the first week or so. After that, hunger isn’t so noticeable, energy level is normal, and I feel just as I usually do, except I am loosing about a pound a day. I have read the reports about the use of HCG and the criticism of this diet. No, HGC is not approved for weight loss, but it is for other uses and has no stated side effects. After all, it is produced by pregnant women to aid in fat release and consumption during pregnancy. The main argument against the diet is that it isn’t tested, so it isn’t recommended. This overlooks the 20 some odd years of testing the author of the diet performed prior to publishing the diet and the use of similar protocols in the past (before Keys and his fat is evil crusade). Personally, I really don’t care if HCG works the same as a placebo or not, because the program works. I have read about several nearly identical diets used for 20 odd years before WWII had the same regime as the Simeons diet, so it might not be needed. The upside of using HCG is that is prescribed, and medically monitored. I see my Dr. twice a week, for a check of my vitals, and a B12 shot. So far my blood pressure is down, my weight is down, my body fat percentage is down, and I feel fine and am looking forward to the 6 week transition to a carb restricted diet tailored to my sensitivity to carbs.